First impressions can mean everything. It matters if you have a bright, welcoming outdoor sign, beautiful interior signage, and a consistent brand that sends the message you want to convey. Classic Sign Services in O'Fallon, Missouri, considers sign making an art and takes great care to build every sign with the utmost accuracy and respect for your image and business brand. When it comes to sign building and digital printing, our selection is vast. We offer illuminated LED outdoor and indoor signs of all sizes, types, and styles, on any substrates including large-format digitally printed yard signs, golf signs, banners, marketing signage, channel letters, and EMCs with the most advanced technological options available. First impressions can mean everything. It matters if you have a bright, welcoming outdoor sign, beautiful interior signage, and a consistent brand that sends the message you want to convey. Everyone in need of signage! Whether you want one sign or hundreds, we’ve got you covered. It is our specialty to help you, our customer, design, install, and maintain your signage and lighting. We know creating quality signs is an art; we take great care to ensure your signs fit your image. Our project managers oversee the complexities of every part of your sign project, from surveys, recommendations, permits, and sign acquisition to installation and lighting. There are many sign and lighting companies to choose from that's why customer service and high-quality products are our #1 priorities. We never take your business for granted, we keep control of every project with our own in-house team, and align with the best American companies and manufacturers for signage and materials. Because we value quality and want to take responsibility for your job being done correctly, we have our own in-house graphic designers to help you from concept to completion, skilled digital printing technicians, and licensed installers who value safety and perfection; it is our goal to make your sign experience stress-free and seamless. We like to think outside the box and offer signage that gets noticed. Pavement and sidewalk decals are still burning up the sign world (#1 sign product of 2013), and we offer other unique items like custom flags and window graphics, vinyl letters, and perfs. For a really high-tech, head-turning sign, we offer the latest video and messaging EMC boards and centers that can display video messages and track traffic and unique patterns to give you an extra advantage. And we don't stop there – we produce large and small format high-quality digitally printed signs (think yard signs, realtor signs, banners) to round out your brand and elevate special events. We have the newest high-speed digital printer that prints on any substrate with detail and in-depth shades of color, reproducing photos and intricate graphics so clearly, they almost look 3-D. And we can do in minutes what used to take hours for a fast turn-around and competitive pricing. Our highly trained technicians and licensed installers perform neon and fluorescent to LED conversions, parking lot lighting, and sign and lighting repair and maintenance. LED provides a more ambient light without any heat, saving energy and expenses. Our LEDs last 30,000-50,000 hours and are not affected by temperature fluctuations. Reliable, attractive, and insect-free. 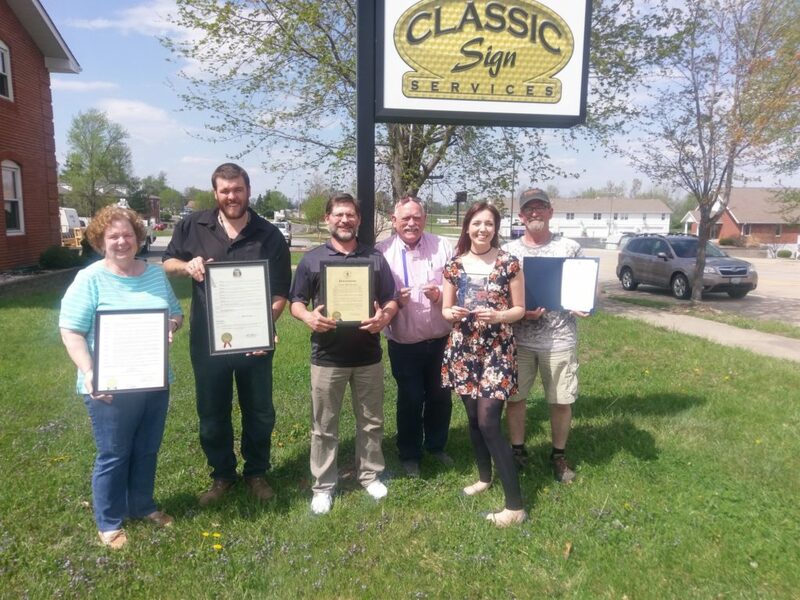 For over 18 years, Classic Sign Services has been helping St. Louis, St. Charles, Lincoln, Warren, and Franklin County businesses and non-profits improve their visibility and share their unique brands with professional sign packages. Our mission is to make your sign project – whether it's yard signs or an EMC – easy and affordable with on-time delivery and the desired outcome. We take away the stress of trying to do it all yourself and become your go-to signage partner. If you are a business, school, church, medical facility, retailer or wholesaler, non-profit, realtor, golf community, or anyone else in need of signage, Classic Sign Services is your premier St. Charles and St. Louis area signage partner.